I've learned when God repeats things, he's pretty serious about me listening. 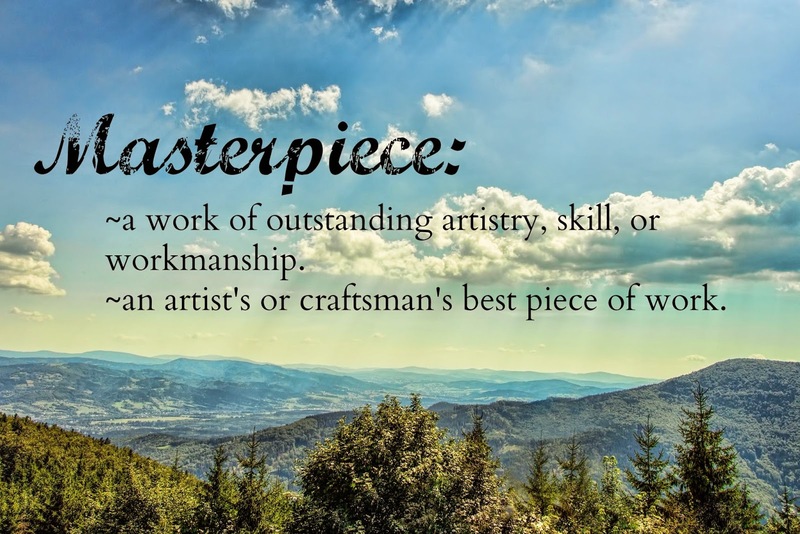 So lately as he's been pushing me into the word masterpiece, I decided to really stop on that word. I've been doing a lot of digging into it, pondering, and writing, and today I wanted to simply share the tip of what he's been showing me. We are works of outstanding artistry. We are our Artist's best piece of work. It doesn't matter how anyone else views us. It doesn't matter what they title us. It doesn't even matter if they like us. Just like the hundreds of people through an art gallery in a day, not everyone shares the same taste in art. Yet their opinions don't change the paintings on the wall or the reason behind the artist's hand in creating them. Not one person can walk through and slap a new name plate on the display. No patron can diminish the artist's love or intent behind the creation of that piece of art, or change the purpose with which it was created for. And the Artist that created you considered every brush stroke, every angle, and every color that went into you. God knew what he was doing when he formed you, and when he finished he stood back in awe. There is nothing like you. Do you struggle with believing you are unique and created with a purpose? Oh, dear one, we all do at times. I challenge you to write out today's verse and memorize it. Let it sink into your heart that you have value beyond measure and a purpose God planned out specifically for you before time even began. It is hard to believe we're a masterpiece. Thanks for the reminder. Now I think I'm going to remind my kids. Have a great week! I agree. I need to remind my kids that too. I try to live it so they'll see it, but I think it's hard to grasp at any age! :) God does that, doesn't he? I struggle with the concept too. When I actually stop and think on it, I grasp it. But in my day to day, I'm not always living it!